The Spy’Ranger unmanned aerial vehicle has a wing span of 3.9m. Image courtesy of Aviation Design. The mini UAV is launched using a lightweight ramp. Image courtesy of Aviation Design. The Spy’Ranger UAV has a speed of 90km/h. Image courtesy of Aviation Design. 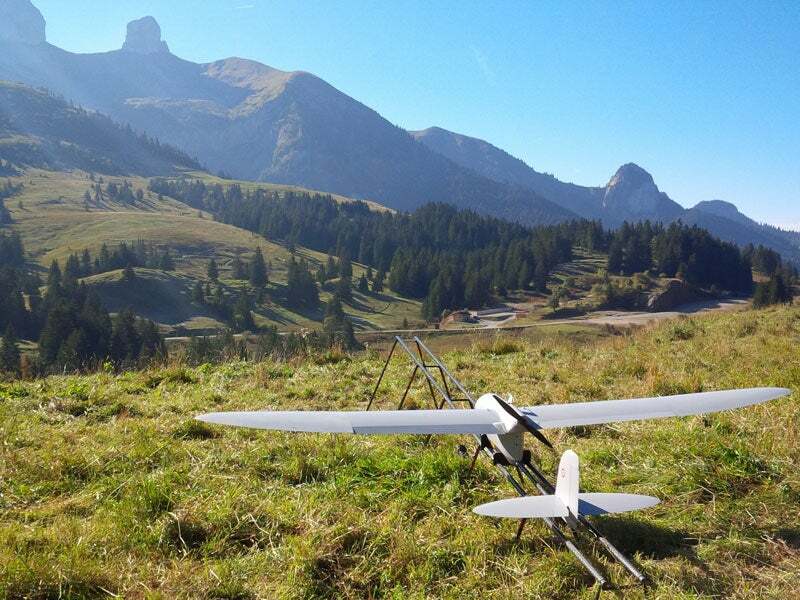 Spy’Ranger mini unmanned aerial vehicle (UAV) system is developed by Thales for use by the armed forces and special forces units in applications such as airborne image intelligence, surveillance and reconnaissance (ISR), and target acquisition. The UAV has the ability to operate in battlefields and hostile environments at long ranges both during the day and at night. The French Defence Procurement Agency selected Spy’Ranger mini surveillance and reconnaissance UAV for the mission requirements of the French Armed Forces in January. A total of 210 UAVs are expected to be delivered to the French Armed Forces beginning 2018. Each Spy’Ranger tactical unmanned aerial system consists of three mini aerial vehicles, a ground control station and associated technical equipment. It is carried in a tactical backpack. The UAV features a fixed-wing design with lightweight, compact airframe built by French-based Aviation Design using all-composite high epoxy carbon materials. It has a wingspan of 3.9m, while its maximum take-off weight and payload capacities are 14kg and 1.2kg respectively. It has the ability to perform repeated take-off and landings in confined areas and difficult terrain conditions. A lightweight ramp of carbon fibre sandwich construction is used for launching the UAV. A replaceable foam skid is fitted to ensure safe landing of the drone. The UAV can be optionally provided with near-infrared laser illuminator, hand-over capability, and 3D-simulating system. The Spy’Ranger mini UAV comes with a customised multi-sensor optronic gimbal payload pod, manufactured by French UAV payload systems developer Merio, to assist in ISR missions. Featuring three-axis electronic stabilisation, the nose-mounted payload system incorporates two gimbals with high-definition electro-optical / infrared (EO / IR) sensors gyrostabilised in two axes to capture imagery and video in day / night lighting conditions. The onboard sensors provide automatic target detection of stationary and moving objects, video tracking and geotracking functions. The UAV can operate in pilot-assisted and fully automated modes. In the pilot-assisted mode, the drone is controlled by a single operator using a geographical information system from the ground control station. "The UAV has the ability to operate in battlefields and hostile environments at long ranges both during the day and at night." The UAV executes missions autonomously from take-off to landing in the fully automated mode. It is fitted with a high-speed encrypted tactical data link for secure transmission of high-definition imagery and video acquired by the onboard sensors to the ground control station in real time to a distance of up to 30km. The ground control station provides the operator with the ability to operate and control multiple UAVs. It is interoperable with a man-portable multifunction camera and ground surveillance radar. It consists of a ruggedised laptop computer, which stores sensor data and displays the UAV’s flight information in 3D maps in real time. The ground control station can interconnect to a C4I (command, control, computers, communications and intelligence) system. Powered by a high-performance DC brushless electrical engine, the Spy’Ranger mini tactical unmanned UAV can execute missions for a period of two hours and 30 minutes. It has a range of 15km to 30km and a maximum take-off altitude of 4,500m above sea level. Spy’Ranger can fly at a top speed of 90km/h and withstand wing speeds of approximately 19m/s. MICCAVIONICS is a manufacturer of highly innovative integrated time-critical solutions of information mission management and command and control systems to be used in a civil and/or military environment, including joined operations (land and air) or coalition operations (multination).